If you are on Facebook, be sure to friend Sandra L. Latimer. Every morning when I check Facebook, I know what happened that day in history and if the date is any type of celebration. 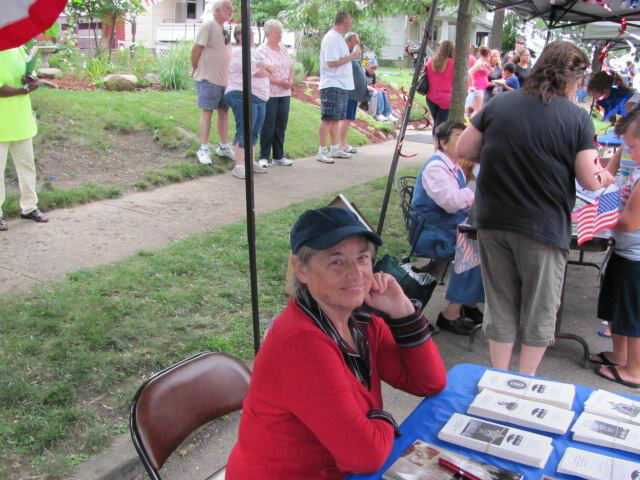 She is dependable on Facebook and as a unique and valued member of NFPW and Ohio Professional Writers and has written a book about poodles. Tell us a little about you: I decided at the age of 12, I wanted to be a baseball announcer. Dad said I’d have to learn journalism. That fall, a few weeks after my 13th birthday, I was offered the position of area correspondent to my local newspaper, and I’ve been writing ever since. Besides writing for a local weekly newspaper, I edit a newsletter and write brochures for a cemetery. In my spare time I wrote a book about raising nine toy poodles in 27 years, and am putting the finishing touches on a book about a 45-year friendship with my former boss. I also have outlines for a couple more books. Any career advice you would give? If you can write, you can do anything. Which historical figure do you most identify with? It has to be someone around Civil War times. That is one of my favorite periods of history. I could understand that era of history so well that I often thought I must have lived it in a previous life. I’m not quite Scarlett O’Hara. Which words/phrases do you most overuse? Is this a family blog? One word or phrase I find myself saying is not quite printable. Which talent would you most like to have? I love music and took piano lessons for years and played French horn in high school band. I only wish I’d been taught what I could do with that musical ability and performance. If you could live anywhere, where would it be? As I’ve traveled to many areas of this country, I have asked myself if I could live there. Is there a job for me? A future? But I return to Columbus and dig myself in deeper. I can’t even go back to the community where I grew up. I left there nearly 50 years ago because there was no future for me then. What book are you reading? Ready to start ‘Return of the Gold’ that I bought at the NFPW silent auction in Salt Lake City. I’m waiting to get ‘Michael Vey 3’ and ‘The Longest Ride’ from my local library. What would people be surprised to learn about you? In junior high, I picked strawberries for 10 cents a quart, mowed the church yard and cemetery weekly for 25 cents each, and rode my bicycle through the area selling greeting cards, all in addition to writing for the local newspaper. Why is your affiliate and NFPW important to you? I’m stuck as president of Ohio Professional Writers. I’ve been a member since 1979. Not only does it look good on the resume, but it also has provided me with another outlet of learning and putting new techniques into practice. My questions about blogging were answered at the San Antonio conference, and family writing came up at the Iowa/Nebraska conference. I’ve also met a lot of interesting people and been able to visit places I might not otherwise have had the chance to see. Ways to keep in touch. People can follow me on Facebook (Sandra L. Latimer) where I post a daily historical item. I’m @sandisports on Twitter. I have a website http://www.poodlemistress.com for my book and http://www.sandlot.typepad.com for my walking escapades. This entry was posted on October 31, 2013 at 5:15 AM and is filed under Uncategorized. You can subscribe via RSS 2.0 feed to this post's comments.